Insidan ▶ Spotlight ▶ Does it pay to advertise? Does it pay to advertise? This is the sight that greeted folk on Corson a few weeks ago: a pizza company had blitzed the place with advertising signs in the ground and stuck to the lamp-posts. But is anyone allowed to advertise on campus, however they choose? No, they can’t. 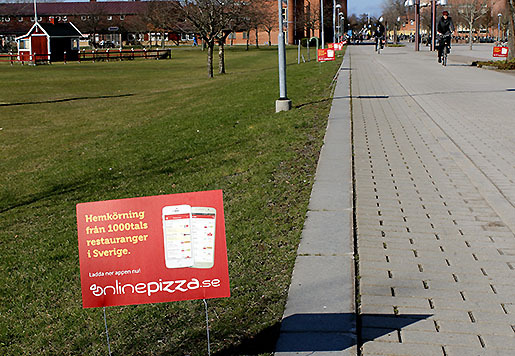 In this particular case, the pizza company was ordered by Akademiska Hus to remove the advertising within 24 hours and restore the lamp-posts to their original condition. Failure to do so would result in a demand for payment. The grounds of Campus Valla are owned by Akademiska Hus, so from a legal point of view, they are privately owned. Corson, however, is an exception. The municipality of Linköping has what is known as an “easement” here, since it is a passage for everyone who walks or cycles through Campus Valla. Thus, Corson is part of the public roads network, and the same regulations apply here as elsewhere in the municipality. The Department of Facilities Management is often approached by companies that view the university’s students and employees are prime targets for marketing. Annika Samuelsson, facilities manager at Kårservice, is responsible for the company corner. 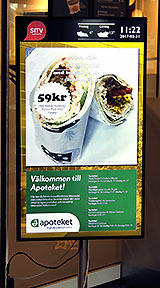 Kårservice is also responsible for Blå havet, where student societies can advertise their activities. Carlsons Bbq in the C Building sells advertising space on its menu screens. Can they do that? Sometimes there are people on campus with free samples or other giveaways. Is this permitted? So what should we do if we see unauthorised advertising or other marketing activity on campus?